Event are actions a user takes on your website, application, or service. These events can be used to trigger a campaign, to determine whether a campaign goal has been reached, or to apply filters in a campaign. You can add a delay, or add a filter, to further refine your campaign. For mroe information, see Understanding Connect events. To access the Events page, click the Settings icon ( ) in the left toolbar, then select Events from the left-side toolbar. 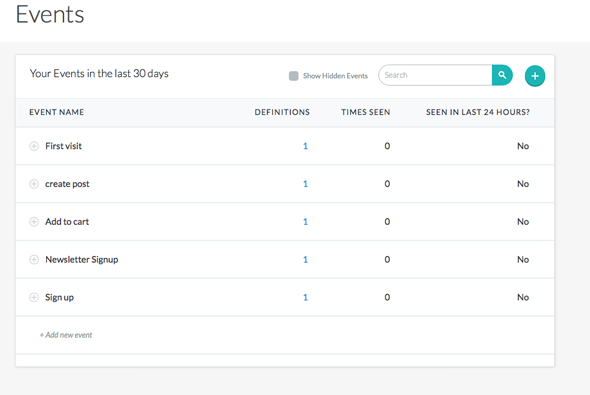 By default, the Events page displays a table of the unhidden events seen in the last 30 days, the amount of times they have been seen in that period, and whether or not they’ve been seen in the last 24 hours. 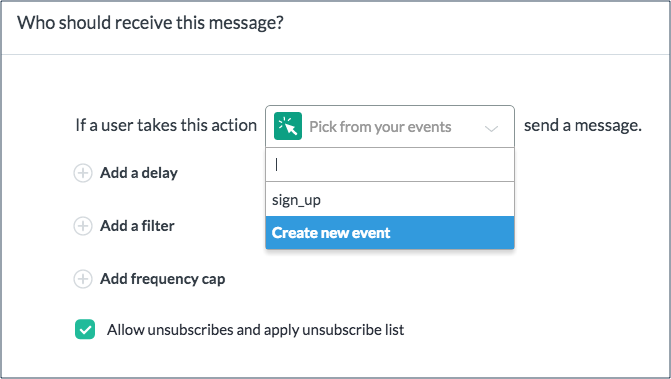 To create a new event using track calls, see Tracking an event. You can create a new event by click "Create new event" in the dropdown, see screenshot, while creating a new trigger campaign. You can also create new events while adding a filter. On the Events page, click Add new event, or click the add new event button ( ). Enter an event name, then click Add. The new event is added to the Events list. When you've created your event, you can add the properties that describe this instance of the event. For example, if you have an e-commerce site with an event called "Add to cart," it may have the properties "product name," "price," and "product SKU." The values for these properties are dynamic, and change with each event. Once an event has event properties, these can be used to help you filter for more specific users while creating a campaign. Next to the event you want to define, click the + icon. Click Add new event property. If your Events page is becoming too crowded, you can choose to hide events on the list. On the Events page, hover your cursor over the event's row. The event is hidden from the list. On the Events page, click Show Hidden Events at the top of the page. Hover your cursor over the event's row, and click Show. You can perform a keyword search of all events using the Search box at the top of the page. Search results include both hidden and shown events.